The Honor View20 is grabbing everyone's attention thanks to its 48-megapixel sensor but does it really make a big difference to the quality of images captured? Let's find out. The Honor View20 will grab the attention of photographers with the headline '48-megapixel camera' and rightly so, it's a pretty cool thing to see in a smartphone. It's great to have such a high-resolution sensor built in but a lot of the shooting features switch back to a 12MP image quality option, the smartphone still uses the 48MP lens, and the Sony sensor technology to capture images, combining the pixels to output images at a smaller 12MP size. This occurs when using the portrait mode, aperture mode, night mode etc. Is this necessarily a bad thing? No, it's not, but with the device advertised as a 48-megapixel shooter, it would be nice to see this resolution used more often. When you can shoot 48MP images, detail is excellent and you only have to compare similar shots taken with a smartphone with a smaller sensor to see the difference. Having said that, you do have to look rather closely to see how much detail the smartphone is capable of capturing in a 48MP image so is it something most who just upload to social media will need? Perhaps not, but the option is there so why not invest in a smartphone which gives you the option to shoot in a little more detail? Even more so if it won't break the bank. Overall, image quality is good (both 48MP and 12MP) with an accurate reproduction of colours (even in dull conditions) and the night mode is particularly impressive as you don't even need a tripod (thanks to a clever night scene mode)! Selfies look great and portraits, particularly with a bit of bokeh, are excellent. The design is great, particularly with the cool nanolithography and the screen is a really decent size, even more so with the cutout camera rather than a top-notch taking up room. 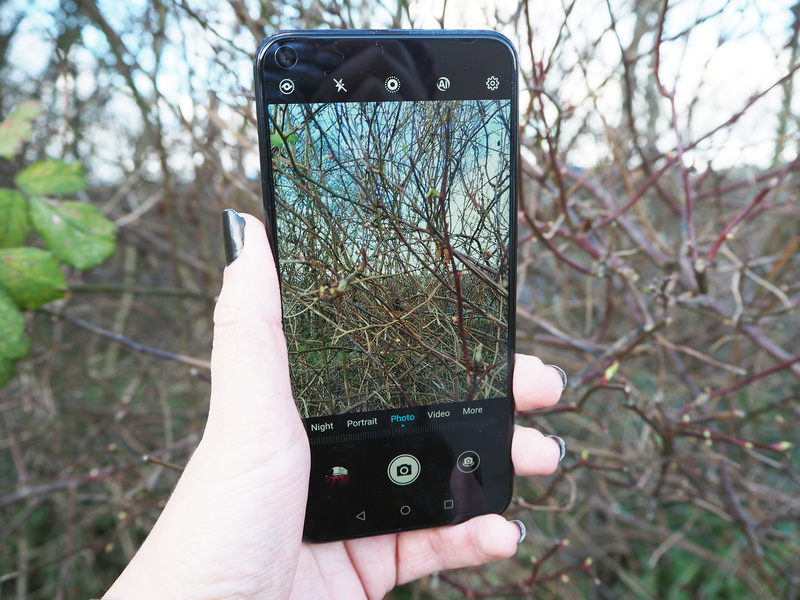 If you're looking for a reasonably priced smartphone that's full of camera features and is capable of taking really good photos - have a look at this one. Honor is stepping out of the Huawei shadow with the release of a 48-megapixel smartphone with a rather smart design and a rather good screen-to-body ratio. The Honor View20 was actually announced back in December (2018) but it's not until today that the smartphone has been launched in the UK, and that we've been allowed to give our full opinion. Billed by Honor as a 'powerhouse device', the View20 lines-up with impressive specs but does what we see on paper match up with real life? Let's find out. 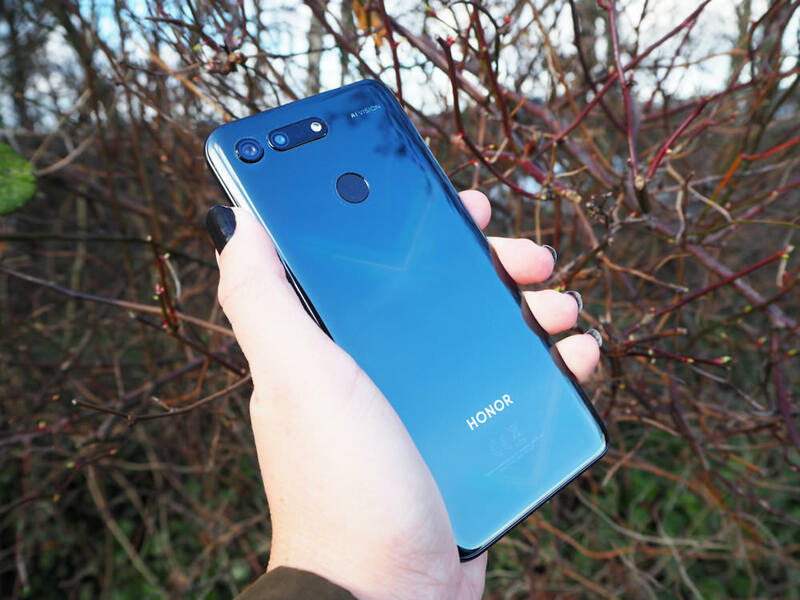 The Honor View20 has many features with the 48-megapixel f/1.8 rear camera sitting in the number 1 spot for what Honor is singing about. As well as the 48-megapixel sensor, there's a rear 3D camera which is used for depth sensing for bokeh-filled portraits, a night shot mode to help with low light, an AI camera assistant and various portrait modes. Video can be captured in 4K and there's a super-slow motion mode. The display is described by Honor as being 'All-View' as there's no top notch so the 25MP f/2.0 selfie camera sits in a cutout, giving a better screen-to-body ratio and a rather decent 4000mAh battery powers the device. Other key features, some of which were first seen on its Honor View10 predecessor, are listed below but the price, as of yet, is TBC as no details were released prior to launch. Honor has said that the View20 is not intended as a direct replacement for a professional dedicated digital camera. That’s despite it now offering that whopping image resolution - once the preserve of medium format digital cameras costing tens of thousands of pounds. But, with so many other smartphones out there, it makes much more sense to go head-to-head with other phones. Plus, as our comparisons have shown, even though smartphone image quality is getting better, they can't quite match the image quality of a dedicated digital camera.... yet. 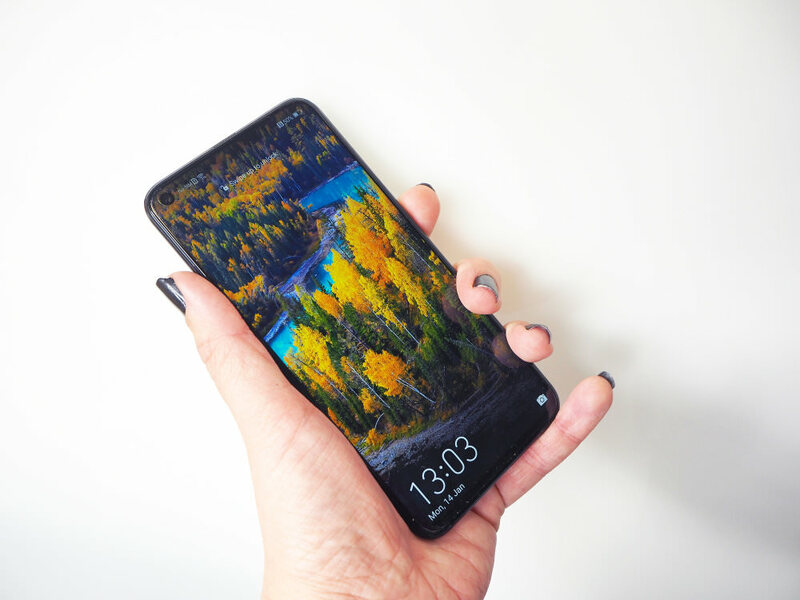 At first glance, the Honor View20 looks like any other smartphone with its rounded corners, aluminium frame and glass front/back but look a little closer and you notice some design tweeks that make it stand out just that little but more. First up is the hole in the top left corner of the screen which Honor put some serious research into to ensure it's small and that no light spills from the screen into the lens compartment when taking photos. Instead of drilling a hole that goes through all of the layers the screen is made up of (which can make the screen fragile), the Honor Engineers only had to drill into one layer and they used an 'advanced lithography process' to create the transparent hole the camera sensor sits in. As well as the cutout camera, if you turn the View20 over, bands of colour will catch your eye which have been created by using nanolithography - the process of etching, writing or printing to modify a material surface with structures under 100nm. Honor throw around terms such as 'of nano-vacuum coating' and 'invisible aurora texture process' but basically, it's a method for creating coloured chevron-like shapes on the rear of the phone that 'magically' change colour, appear and disappear when you tilt or angle the smartphone. It's a subtle bit of visual 'flair' but we do like it. 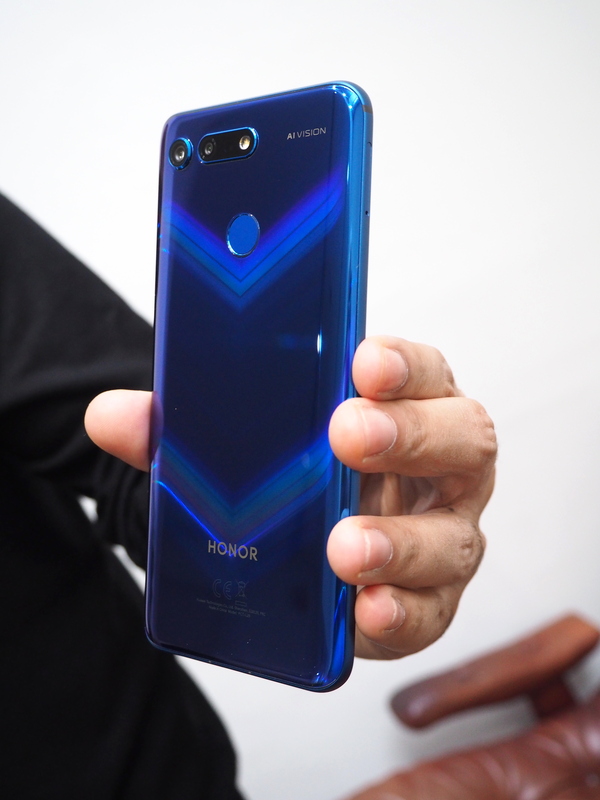 Speaking of colours, in the UK the Honor View20 handset comes in a choice of three: Phantom Blue, Midnight Black or Sapphire Blue. 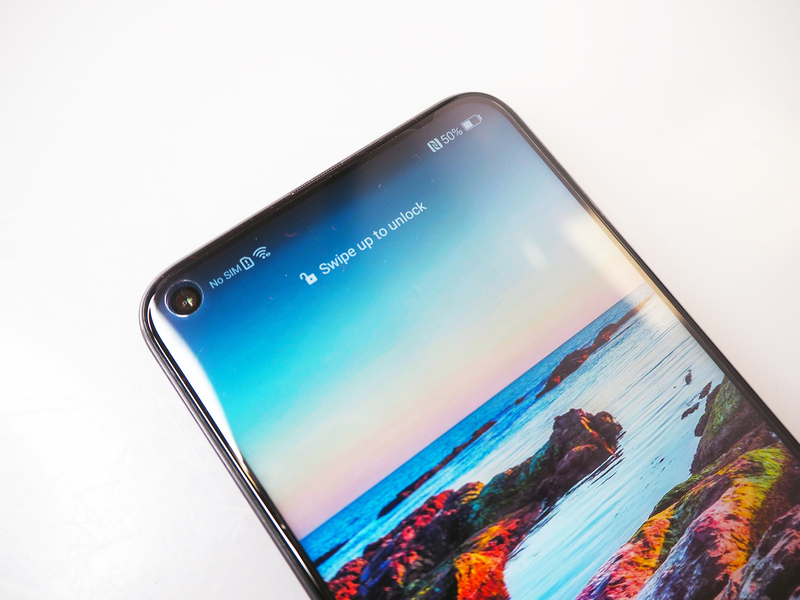 Plus, you can pop on the clear silicone case that's provided with the smartphone to keep it a little bit safer but it means you can still show off the magic feature of the View20's colour-changing chevrons. Staying on the rear of the View20 smartphone and you find the 48-megapixel camera (it looks pretty big) along with the 3D sensor for depth sensing and a flash. There's a fingerprint sensor built into the rear of the smartphone, too, which is placed perfectly for your index finger. To the side are the volume/power controls and on the bottom is a speaker and USB-C charging port. There's also a 3.5mm headphone jack but this is built into the top of the smartphone which makes it easier to plug in headphones when your phone is in your pocket. The Honor View20 might have size-specs that make it sound big but it's not really, with it actually looking a bit more compact than some other smartphones. In the hand, it fits comfortably and can be navigated easily. Those with smaller hands might find it a bit trickier to balance and as with any smartphone that has a glass back, take the case off it and it's a bit slippery so be careful. As a result, when taking photos, we do recommend you hold the device in both hands to stop shake spoiling your shots (and to ensure it doesn't crash to the floor). Fingerprints can be a nuisance but when are they not on smartphones nowadays? Turning our attention to the display, it's all about getting more screen 'real estate' and Honor has done this by reducing the size of the bezels and removing the top notch to increase the screen-to-body ratio (91.8%). The 6.4inch, 2310x1080 pixel, 19.5:9, FHD+ display is bright, big and we don't really have any complaints about it. Time will tell if a cutout is prefered over a top notch but in all honesty, the cutout doesn't distract as some thought it might and it doesn't get in the way either as when you get notifications, they adapt. You can create a black band if you find the cutout really annoying, which some might want to do when watching films or playing games. The camera sitting in the 4.5mm front cut out is a 25MP f/2.0 selfie camera that you can use all the effects from the Portrait mode with (clever technology rather than depth sensing with a second sensor) as well as capture video and use the normal 'photo' mode. We'll be looking into the image quality of our selfies in more detail in the performance section of the review. As mentioned, the main camera is a 48MP shooter which has the help of a 3D camera to give images depth and you can also use it to shoot with a 2x zoom. The 48MP camera is powered by the Sony IMX586 48MP sensor which measures 1/2" and has 0.8µm pixels. Quad-Bayer Array technology is also built in to improve resolution and light sensitivity. We've seen this technology before on more expensive smartphones, such as the Mate 20 Pro, but up until now, we've not seen it in an affordable Honor smartphone. The technology is particularly useful in low light and at night as it uses 2x2 adjacent pixels in the same colour, increasing light sensitivity and keeping noise to a minimum and raising the sensitivity to a level equivalent to 12 effective megapixels. You can choose between using the 48MP sensor or reducing the image quality to a 12MP resolution if you like and some of the features in the camera app also switch to the 12MP option (something we'll cover under the performance section). With artificial intelligent capabilities powered by the Kirin 980 chipset, you can also use what Honor is calling an 'Ultra Clarity' mode. 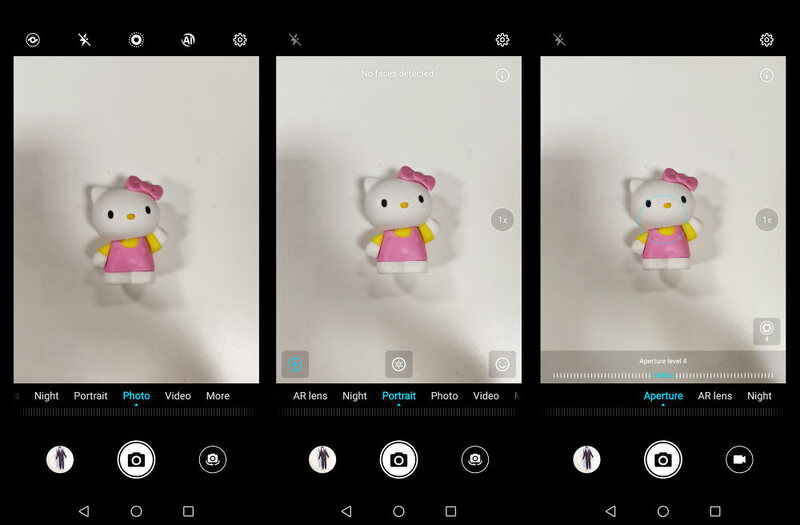 When this mode is turned on (choose in the setting menu and the AI Ultra Clarity mode will be enabled automatically), the camera will take several 48MP pictures at once. Next, the CPU and dual-ISP of the Kirin 980 collates the best details from each of these 48MP photos and combines them to create one 48MP picture. Then, the Kirin 980’s dual NPU begins to process the photo using an advanced AI algorithm – the quality of the photo is assessed, details in dark areas are optimised, and colours are adjusted. You can see how well the AI Ultra Clarity mode performs in the next section of the review. As with other Honor smartphones, AI can also be used to recognise over 1,500 scenarios and more than 60 categories to help you capture more vivid landscapes and better foodie photos (to name but a couple of scenarios). The View20 also gives you access to 2x zoom but this is only accessible when using the 12MP file size, not 48MP. Portrait mode (with the rear and selfie camera) gives you access to various bokeh effects (you can shoot without them but why would you unless you have a breathtaking landscape behind you? ), lighting effects and beauty/shaping modes. You can utilise the 2x zoom if you wish, too. Turn on night shooting mode and you can capture hand-held night shots - it works by the AI capturing multiple frames to create an image from. The camera uses the power of the 48MP sensor to capture 12MP low light images with less noise, less blur and impressively, you can hold the smartphone for 6 seconds (without a tripod) and images still look good. Other modes include a Pro mode, panorama, HDR, Light Painting and Time-Lapse which can all be found under the 'More' tab in the camera app which, overall, is easy to use and those who have used Honor smartphones before will be very familiar with the layout. As for video, this can be captured in 2160p at 30 frames per second (fps), 1080p at 30fps and 720p slo-mo at 960fps. In terms of capacity and performance, there are two variants for the UK market – choose from either 6GB RAM and 128GB of storage or 8GB RAM and 256GB of storage. Battery life - A 4000mAh battery is found inside the View20 and it's plenty big enough for an afternoon of capturing photos and video. The device also offers 'supercharge' which can charge the battery to 55% in 30 minutes. Looking at those images I'd say that 48mp is a complete waste of time and merely there as a marketing number! My 'ancient' iPhone 6s does better. Looking at those images I'd say that 48mp is a complete waste of time and merely there as a marketing number! My 'ancient' iPhone 6s does better. I cannot see great detail, in fact the 48mp image of the house, looks very blocky.. Until it can shot RAW images and not convert them to jpg, then having such a high res sensor, is a total waste of time.. None of the images in the sample gallery were that impressive at all. I'll stick to my DSLR.. For me, smartphone cameras, despite all the hype, are nothing but a gimmick. Yes there are a few out there, that are pretty impressive for their size and the images on the tiny screens, area very passable, but for any serious photographer, they are never going to come close to a full blown DSLR. They may be less expensive, take up less space, be more convenient etc.. but for me, I prefer a real camera. I'm sure I'l get a lot of backlash for saying that, but hey, everyone has an opinion and they are entitled to it.